It's time for our 8th annual community yard sale! NNA is organizing a neighborhood-wide day of resale. Looking to register your home as a seller? Read on! ALL YARDS MUST BE REGISTERED BY MAY 18th TO PARTICIPATE. Participation is free for members, $20 for non-members and comes with a family membership through the end of 2019. This fee will cover the cost of promoting the event through advertising as well as the printing and thorough distribution of posters and postcards. We will also work with the Alderman's office to pull the permits, but you must be registered by the deadline of May 18th in order for us to do that and be included on our map. 2019 BLOCK CHALLENGE: Clusters count - the more homes that participate on a block, the better traffic your block will receive. 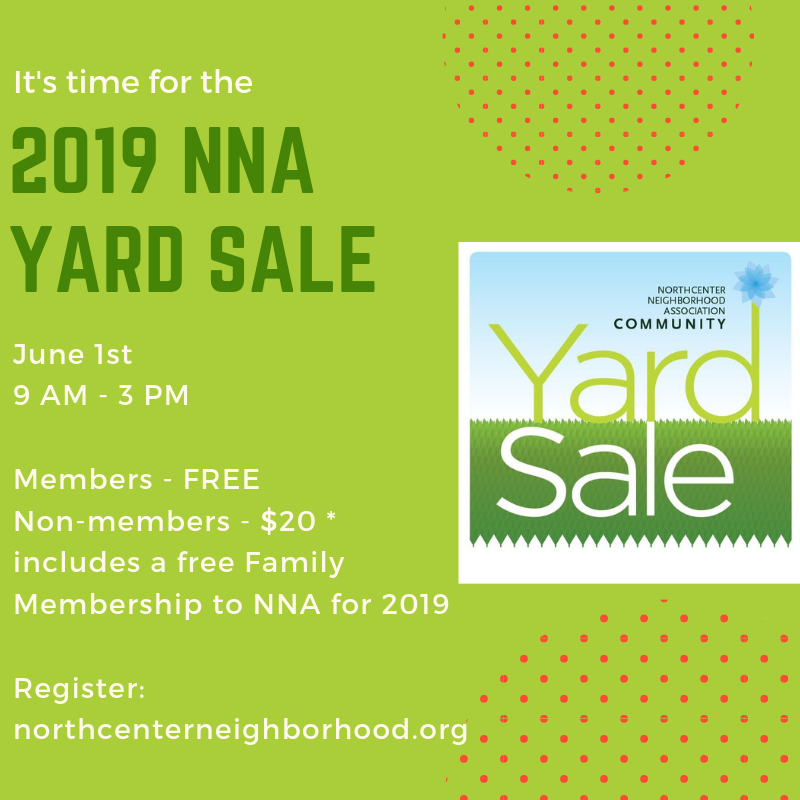 This year, to encourage participation NNA will provide a pizza lunch for the block with the most homes participating on the day of the Yard Sale. Have lots of items to sell, but not enough room in your yard? Partner with your neighbors! Ask a friend who is registering if you can bring your items to sell out of their yard. Only the yard which will be a stop on the map needs to register. If you have any questions, please contact us at northcenterneighborhood@gmail.com. The Northcenter Neighborhood Associations's boundaries are: Addison on the south, the Chicago River on the west, Montrose on the north, and Ravenswood on the east. Click here to view the map of our area. Participating homes must fall within our organization's boundaries.